The optical firm responsible for producing the Zeiss microscope got its start in 1846. Although the founder Carl Zeiss passed away in 1886, the company has remained a leader in the production of high quality optical instruments for over 100 years. The company was founded on the notion that innovation is the key to success, a philosophy that continues to this day. By 1925 Carl Zeiss Inc. had opened a sales branch in the United States. 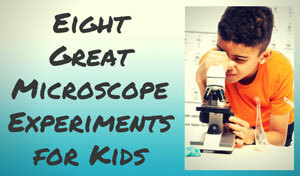 Over the following decades, it saw a rapid expansion in the production and sales of various types of microscopes. Ever since then, their products have developed into a variety of models that fits many needs. Zeiss has left its mark on the stereo, inverted, upright, and confocal microscope. Stereo microscopes, also called dissecting microscopes, are unque in that they provide a three-dimensional view of the specimen. They do this by using a separate objective lens and eyepiece for each eye, creating the separate optical channels that are needed for a three-dimensional image. What are the benefits of using a stereo microscope? They give you large working distances and objective fields. These features are necessary when doing something like working on small circuits, industrial inspection, dissection, or microsurgery. The Stemi DV4 Zeiss microscope was designed with a low cost in mind. Although it is a very reasonable priced stereo microscope, the Stemi DV4 doesn’t lack quality. This microscope is compact and durable, but still has the same great optics expected from Zeiss. The Double Lens Vario on the Stemi DV4 has high-resolution and yields exceptional image, whether a user is looking for an overview or a minute detail. The images are brilliant from 8x to 32x. For an advanced level of stereo microscope, customers can look to the SteREO Discovery.V20. This model was made for demanding projects. 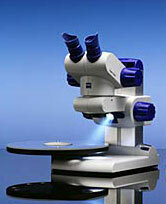 The features of this Zeiss microscope can aid biological, medical, or material analysis. The SteREO Discovery.V20 has a 20:1 zoom range. It also comes with plane-field apochromatic correction of the zoom optics. With the assistance of the 10x eyepieces, this microscope can magnify a specimen up to 345x. Even at the highest power, this Zeiss microscope still produces an outstanding impression of space. It is also comfortable, reliable, and easy to reproduce results. The reproducibility of magnification is around 99%. An inverted microscope is different from an upright microscope in that the illumination comes from above the stage and the objectives are below the stage pointing up. The inverted microscope was made to study living cells and organisms, as it allows you to observe them in their natural state in a larger container rather than just in a flat glass slide. There are three inverted microscopes in the Zeiss microscope family that have become well-known; these are the Primo Vert, the Axiovert 40, and the Axio Observer. Each of these Zeiss microscopes has quality optics, but each has advantages that make them fit into various applications. The Primo Vert (right) is used in genetic research on plants, animals, and even humans, with a design that lets the user check progress at a glance. The Axiovert 40 has made big leaps in contrast control. Whether samples are thick or thin, the Axiovert 40 can handle them. It's also known for its comfortable design, a user can position the sample on the stage and look through the microscope without any problems. The Axio Observer is best known for its flexibility, as it was designed to be adjustable to the needs of its users. There are many ways that the users can alter or modify the Axio Observer in order to make it fit their project. Check out this article for a closer look at these Zeiss inverted microscopes. In an upright microscope, the lenses are above the stage while the illumination system is below it. This is probably the most common type of microscope, and can be used for many different biological applications. Zeiss produces a very noteworthy upright model, the Zeiss Primo Star microscope, which has been hailed as the education microscope. It is filled with features that make it ideal for classrooms or training situations. The Primo Star is easy to operate. It was built to withstand the possible abuse and misuse that comes with the learning environment. The optics, however, are still of the same quality that is expected in every Zeiss microscope. The price and quality make it a perfect fit for a classroom, a laboratory, a clinic, or even in the field. A confocal microscope has a small depth of field, but shows images in great detail. They have become quite useful in the life or material sciences. The models that Zeiss makes are designed for biomedical research. There are a number of Zeiss confocal microscopes, with one of the most basic and popular being the LSM 700 (LSM stands for Laser Scanning Microscope). This model fits well with forensics, medicine, the food industry, and industries that examine sensitive materials. It has a compact design that doesn't take up too much space in a lab, while still providing high quality optics. The design of the LSM 700 allows users to measure samples without contact at up to speeds of 100 image frames per second. Despite the fact that it's considered a "basic" scanning microscope, the LSM 700 is still renowned for its high sensitivity and images. 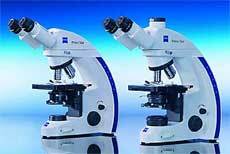 Carl Zeiss microscopes are known for their productivity, efficiency, and quality. Since they can be adapted to fit just about any need, they're wonderful tools for those involved in the professional biosciences. The OPMI PROergo Zeiss dental microscope combines crisp, detailed images with comfort and ease of use. It's a great model for dentists, as it provides a finely detail picture while allowing one to sit comfortably upright.